Use your fabric stash to embellish a denim shirt with this free applique clothing pattern! From the material with the Wonder Under applied, cut two pieces 17 1/2" long by 1 1/4" wide. One will be for the collar and the other one will be used on the cuffs of the long sleeve shirt. Iron pattern pieces on the shirt as directed for the Wonder Under. 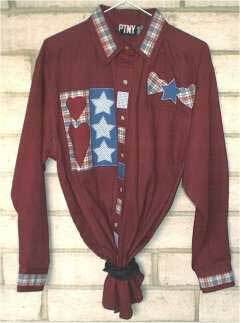 This is an easy and fun shirt to make. Enjoy sewing!!! !